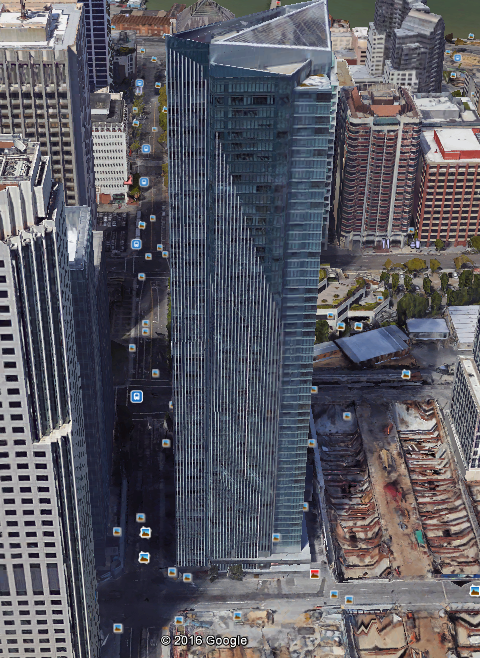 So what’s a condo worth in the 58-story Millennium Tower at 301 Mission St., the most luxurious condo tower in San Francisco, which has sunk 16 inches since its completion in 2008 and began leaning in 2009? The tilt has reached 2 inches. Majestic finger-pointing has ensued. Lawyers have been unleashed. Investigations, studies, and counter-studies have commenced. No one is certain how to repair it, or if it is repairable at all. A few things are certain: Large amounts of moolah will change hands, lawyers will get rich, and if taxpayers don’t watch out, the moolah may well change from their hands to other people’s hands – because the city of San Francisco has been dragged up to its eyeballs into this. Lenders too are on the hook. California is one of the dozen or so “non-recourse” states. Standard purchase mortgages are non-recourse: they’re secured only by the property. When push comes to shove, borrowers might be tempted to let the bank worry about their properties in the leaning tower of San Francisco. Now aggrieved condo owners found a way of biting back: 163 – “including tech executives, sports figures, and real estate investors” – have filed property assessment appeals by the September 15 deadline to get the assessed values of their units knocked down, according to the San Francisco Examiner, which obtained the records through the Freedom of Information Act. As part of their appeals, owners must include an estimate of what their unit is currently worth. Mary Velez, a taxpayer with Raimondo Pettit Group, represents a condo owned by former 49ers quarterback Joe Montana, who had sold one of the two condos he owned several years ago. The one Montana still owns is valued at $2.8 million, but the appeal filed on his behalf argues the condo is now valued at $500,000. “I’m sure nobody really knows the value,” Velez said. Clearly, there is a long line of people jostling for position to buy a condo at the Millennium Tower for $0, or $1, or even twice as much. I know a few potential buyers myself at these prices. I’d even outbid them. Buying and selling a condo isn’t like binary options trading, but at this price, it doesn’t matter if the tower topples in a few years, just as long as you’re not in it when it does. That’s not an issue anyway. Everyone, including Mayor Ed Lee, has assured everyone that the building is safe at the moment, even during an earthquake. At a few bucks, these condos are a buy even if the association fees that are already high will further balloon, given the costs of keeping elevators running, fixing buckling sidewalks and broken pipes, filling cracks in the glorious swimming pool so that the water won’t drain out overnight, and so on. But a condo for $1, even one without a spectacular view, would be a deal. It’s easy to say with hindsight, but you’d think that a tower in the formerly muddy part of San Francisco right by the former shoreline would be built on bedrock, however deep they’d have to go down to find it. But no. And there’s no obligation to disclose to potential buyers that the concrete building is heavy and more prone to sinking than a steel-framed building, and that it was nevertheless built on a concrete slab that in turn rests on concrete piles that go down about 80 feet into mud-fill and sand, and that the bedrock starts at about 200 feet. Taking the piles all the way down to bedrock would have been too expensive, and the developer might have had trouble selling the condos at a higher price. So this is not the only building with this design in that part of San Francisco. If the price is right, there will be a market for these condos. Filing an appeal to knock the assessed valued down to $0, $1, or even $2 appears to be a delicious if utterly dark form of leaning-condo-tower humor by immensely aggrieved condo owners – associated with perhaps some legal benefits in future court battles and settlements. Wolf, how about we go partners? I’ll put up $500, you put up $500, and we send a notice to the appeals board that we stand ready to buy each condo revalued by its owner to under $500 at triple the owner’s value estimate. That is the real test of value – what the owner is willing to sell it for. If the mortgage is non-recourse we can even buy the units encumbered. That is how it was done in Florida. Then we can rent the units out until the first mortgagee forecloses… al a Florida? You in? Oh boy…. buying a property, encumbered with a $1-million mortgage, for a few hundred bucks with the intention of then walking away from said mortgage… “Intention” is a word that triggers all kinds of things. I better check with my lawyer. Sounds like trouble. Montana can handle it. He was always pretty good at scrambling, plus he can always lace up his cleats for traction. Turf cleats should work well in a condo. I’m sorry, this article does not twig my sympathy strings. I am more concerned with people who have been squeezed out of every property market due to the insane RE surge from ZIRP monetary policies and the destruction of yield. The rich condo owners have options and recourse. Undoubtably, redress has already been discussed behind closed doors. Everyone else, not so much. I was just going to hit send and remembered the first house I ever rented. My best friend and I rented a little two bedroom shack in a very rural area on Vancouver Island. It had been built on a swamp and had a crappy foundation. The floor slope was considerable, but…rent was $75 per month for each of us. I was working construction, he was logging. We saved money at an incredible rate. Anyway, after a winter evening of sitting around with our feet propped up on the oil stove oven door while drinking beer, invariably the contest would begin. We would place our empties on the floor and roll them in a race for the far wall. Occasionally, one of them might hit a chair leg just right and break. It was pretty fun, actually. Montana might enjoy doing that too! But he probably doesn’t have to keep the oven door open to stay warm. We used to do that with marbles when we were kids in our old farm house. The floor sloped so much!! And I really only care about the people forced out of this RE market due to the ridiculous prices. That $1 condo is not insurable in its present condition. If that building topples onto its neighbors, people will die, and adjoining property will be destroyed. That $1 investment may become the worst investment you ever made. In an earthquake it may not topple, it could just sink a few stories into the liquified mud below. I’d reckon floors below level 7 would be quite risky to live in. Especially as the next big San-Andreas fault slip is overdue, and the earth seems to be moving into earthquake season. What bank holds the most non recourse mortgages on that building? Turn it into another tony ‘Frisco tourist attraction. Yup, sounds like a good money making opportunity, at least until the elevator gets stuck in the bent out of shape shaft between the 49th and 50th floor and then you’re stuck with a bunch of screaming tourists who are speed dialing their personal injury lawyers in between breaths. “Charge $25 for a guided tour and a fun ride’ …..
……… that would break a fall ……… right ?? Everyone, including Mayor Ed Lee, has assured everyone that the building is safe at the moment, even during an earthquake. I feel better already. In fact, maybe the good mayor should camp out in the upper floor units as a show of good faith in said safe building. Fun aside, I don’t see how this building won’t have to be demolished. What a mess. How many others out there in San Francisco are built on mud and sand? I have the same question re: how many others in SF are built on mud and sand. I don’t know the details, but I was once told that everything east of the Transamerica tower (the pyramid-shaped building) is built on “fill,” which I took to mean essentially mud and sand. Wolf, if you have better info/more detail, please share. Thanks! I don’t know if the Transamerica Pyramid is anchored to bedrock but it rests on immense springs to absorb seismic shock. San Francisco, unlike other US cities, resisted skyscrapers, in part because of its seismic history and in part NIMBYISM. It was only in the late sixties when hometown companies like Bank America, Wells Fargo and Crocker Bank got permission to build their HQ towers at 52, 43 and 38 stories respectively. Transamerica’s pyramid was originally going to have a larger base and soar higher but the SF planning folks didn’t want that large of a ‘footprint’ so it was scaled down so as to not be thought of as the model for Irwin Allen’s then in production disaster film, THE TOWERING INFERNO! And everything West and North is built on at fragmented, unstable rock that if you can find a open area showing some of it, and try to stand on it, it will slide right out from under your feet. It ain’t granite under there. I had nightmares living there and the clock ticks. Well, now I’m curious to see what will happen with the other buildings being constructed in the same general area, including the Sales Force tower. That thing is slated to be the tallest building in SF, by a long ways. For example, if you’ve ever taken CalTrain from SF, you know how it winds through town and then runs some distance inland. Until 1915 (was typo, now corrected), the tracks were at the edge of the water. Today, the wide band of land between the tracks and the water is reclaimed land. When you look at the maps, you’ll see just how much of today’s SF used to be water or tidal wetlands. There may be better materials out there. So I encourage you to browse around a little. A picture is worth a thousand scary words. What you are asking about is called “liquefaction”. The basic idea is when energy travels through soils (as an example) it tends to behave more like a liquid. I am sure a bit of google-fu could find you a lot more. If you want to see what liquefaction looks like during “a big one”, this is exactly what happened in Anchorage Alaska during the second most powerful quake ever recorded. damn, Cooter, you beat me to the Alaska analogy…….. Here is an image search result from google for the same phrase – picture worth a 1000 words! The liquefaction was the first thing I thought of when I saw what it was built on. If a major quake happens, it may not just sink several stories-it may collapse to side depending on how the liquefaction spreads. As the “ring of fire” has been quite active of late, I wonder when SF will get hit. All those plate movements are somewhat interconnected. how to underpin what you can’t, that is the existential question. Time to call the Engineering department, and Code Enforcement, in Pisa, Italia. The old World Trade Center in NY tilted up to 6″. I was working there during a rare NY hurricane and got motion sickness. It too was built on landfill. Regarding the WTC, and presumably many other buildings, isn’t the flexibility of a building during high winds, and then its ability to return to plumb (given whatever engineering tolerances) while retaining its structural integrity, different from a building being off-plumb when not under stress? This seems like a different situation. There was a condo tower in downtown Sarasota that was condemned when an entire floor was found to be structural unsound. The repair would cost millions and take years to litigate and complete. Meanwhile the owners had to find someplace else to stay. There were buying opportunities of course from those owners who didn’t have the time, money or desire to live in a cardboard box on the sidewalk while the situation was resolved. Now Millenium Towers doesn’t seem like it will have to be condemned but the repair, if it can be done at all, will be expensive, take a long time and probably affect the quality of life. I just saw a show on all the buildings swallowed up by Florida sink holes. There were some large properties included. Fortunately, we now know that sink holes are caused by Corvettes. We can see this in action in Bowling Green, Ky.
so … do these lowered valuations provide the owners a multi-year income tax exemption? Ok I’m just having fun here so don’t tell me I’m crazy. Trivia- the Leaning Tower of Pisa was stabilized- not sure how but supposed to be safe now. Now here comes the crazy: suppose you owned the building and the lot right next door, which may be causing the tilt. The value of your building is severely hit, but so is the value of your lot. The same thing may happen to a building on it, settling then tilt. How about building the new building with an identical lean in the other direction, with a strong multi- floor atrium joining the two? Like I said it’s an idea just for fun. But I don’t think they can predict in which direction a building is going to lean. It’s not really supposed to lean at all. So what if the new building, for whatever reason, leans the same way as the old building. Now we’d have two fiascoes on our hands. 80′ pilings stuck into sand and mud when bedrock is down 200′ is like putting a brick on a fork into a bowl of pasta, it never should have been approved. Nuclear waste is about the heaviest thing we know of, perhaps we could store it as ballast to straighten out this floating daymare (you can wake up from a nightmare). It could be moved as necessary and perhaps only in the bottom 1/4 to 1/3 of the building. The elevator shafts could be lead lined. Only the peripheral units would need to be used for ballast storage, so possibly the rest of the units on those floors would still be available for occupancy…until things needed to be moved around again. It makes me wonder what the rent would be if someone did choose to live in luxury next to a nuclear waste storage, er…ballast site, would Geiger counters be mounted in the habitable parts of the building? I am reminded of Tonto’s (Pronto?) line from “The Stoned Ranger” “Pound sand, white eyes”. Pounding piles to bedrock is WAY better than pounding piles into sand, that’s just pounding sand. Not sure I can ‘splain this, but the Leaning Tower’s lean was stopped and actually reversed by drilling thousands of small diameter horizontal drill holes under the foundation on the opposite side of the lean. The drill holes were left open as the drill tools were extracted and as the holes slowly collapsed from the weight of the tower, enough holes closed in combination to cause the tower foundation to sink on the opposite side resulting in it reversing its lean. It could have been returned to near plumb but what would the town of Pisa have done without a leaning tower? The ground was then strengthened so as to prevent the tower from resuming a future lean. Only a government project could have paid for this. Reminds me of living in Venice, that worked out okay due to the marvelous engineering. Doesn’t seem like driving piles another 120 feet would’ve been all that much more expensive, considering now they have a building that perhaps needs to be demolished? No backup plan, or is the correct term backup scam? Sell the condos to Chinese communist party members who will buy anything if it lets them get their money out of China’s sinking boat. Even a tilting tower is better than a billion pissed off people who want to hang you from a rope. I know a lawyer couple in that tower. A lot of the tenants will not be able to walk away, given how it will affect their credit ratings. I’ve heard that Mayor Lee has substantial construction interests in SOMA, I wonder it there is any truth in that. Alternatively, why not just hire the Saudis to fly an airplane into it? If the direction were properly chosen it might knock it back into alignment. I have the answer. Let’s get Larry Silverstein to buy it, insure it for double terrist protection of $4 billion and have Cheney and his Saudi trerrists crew fly a 575 into it and then blow it UP. We’ll make a fortune in the insurance claim and on the put options. I think old historical records indicate that as much as 300 to 500 yards of land from the bay shore are land fill from the gold rush era. Not to mention the natural history of the bay shore over thousands of years. Not the bast place to put something really heavy. After a hurried examination by archaeologists, the wreck was crunched up and taken in debris box trucks to a farm outside of Petaluma that was owned by the family of the founder of the SF Maritime Museum. I still have a few brass and copper nails and spikes from the debris. if it leans enough, it would make a most bodacious skateboard run .. no ? On this scale two inches would be difficult to detect and would be so small that it could be in error from any of several sources. I’m not impressed. Wouldn’t it be a hoot if all this consternation turned out to be for nothing? Neither is being built on a liquefaction zone without contact with bedrock. I can’t see it still standing after the next decent earthquake, can you? Probably. But it’s not at all likely to outlive its design life. Certainly the foundation is inexcusable and the project should not have been approved because of it. But it might be fixable, and it still might turn out to be okay. But I think the point is that you couldn’t bet a multi-million-dollar condo on it. That would be a very bad bet, and it’s easy to predict that the courts will agree. If they complete the station next door and the fast rail runs out of there….those vibrations could really do damage that no one could even imagine (other than those smart guys on Scorpion). Millenium Tower or not, when this bubble blows, most people will be knocking the value of their assets way down. the only solution is demolition, and I didn’t need a crystal ball to see that conclusion. I think it’s pretty clear at this point that the bubble has not done wonders for the quality of construction, particularly on the Pacific Rim. Here in Toronto, glass falling off the sides of condo buildings is pretty common. The skins of many of the newer buildings are unlikely to last 20 years, provide next to no insulation, and will be a massive encumbrance on the capital reserve of the condo corporation. Inspections seem to be done piecemeal and reference privately-generated standards that are unavailable to the public and often opaque anyway. It’s hard to say what anything’s worth. I think Wolf’s comments about a lot of money changing hands is spot on. Lawyers, expert witnesses, engineering studies and etc. If, I was a betting man, I would bet that it is going to have to come down. The fix, if a fix is possible, is likely to be very, very expensive. In my 40 years of construction experience I often used the phrase “out-of-sequence-work”, meaning that if you did something in the wrong order you would pay dearly for it later. In this case, the “fix” is clearly out-of-sequence because the time to bite the bullet and sink piers down to bedrock is long past. Now there’s a damned 58-story building in the way and no one can change that. This will end badly. Well, it sounds like the building owners need to do what was done with the Leaning Tower of Pisa – freeze the ground on which it sits. Problem solved. The cost of running that equipment will just be tacked on to the yearly building maintenance fees condo owners already pay. There is some debate about the amount of “tilt” at the top of the building — 2″ to 6″ to 15″ — depending mostly on who hired what consultant. But there is apparently universal agreement on the direction of the tilt, so rather than hire any more consultants or lawyers, here’s what the owner’s association should do today. Along the outer edge of the building’s subterranean slab foundation, on the compass point opposite the direction of the lean, place 28,250 blocks of lead (a cube 30.5 feet on each side, or other arrangements that contain the same), which will weigh about 20 million pounds (10,000 tons). Hire a volcanologist to accurately measure the irresistible effect of this mass on the tilt and sink-rate of the building. As the building approaches plumb, get the lead out and start getting the lead out. Just google “Japan earthquake images” and watch some of the videos labeled “liquefaction” for a preview of what it’ll be like south of Market and on the old filled in ex railroad yards in “Mission Bay”. As a native San Franciscan, I hate newly invented neighborhood names, it’s the purview of real estate hucksters and newly arrived nabobs from Nebraska. Many of the people on Treasure Island in the middle of the bay will drown if there is a “seiche” or “slosh” within the bay caused by the earthquake. There are proposals to build high rise housing there as well. Those near the ramp up to Yerba Buena Island might escape if they can run real fast. San Francisco city government is like one of those ants colonized by a brain fungus that affects the creatures behavior and causes it to do strange and destructive things. The brain fungus is money, which causes some people to ignore reality. I lived in San Francisco for 25 years up through 1991, during which I made much of my income from construction and building maintenance. I once worked on an older wood frame structure a few blocks west of the Millennium Tower in the same swampy part of SF which early San Franciscans joked about “mules disappearing into the mud”. The building was occupied at that time by a punk music mail order startup called Rather Ripped Records (although I was actually doing the work for the building owner). The problem was that the crawl space under the building was constantly flooded with the ancestral swamp water which was higher than the excavation under the building. My solution was to wrestle an old cast iron bathtub under the building and dig it into the mud to use as a sump with a permanently wired sump pump to lift the water several feet to the height of the SF city sewer system. I don’t know how many other buildings in the neighborhood had a similar problem, but in effect the city sewer system was being used to keep the swamp drained on a continuing basis. Curiously, there was a two-species ecosystem in the perennial darkness under this building composed of small aquatic snails who lived on an orange mold or algae which derived its sustenance from the iron-rich waters created by the large piles of machine shop shavings which had been disposed of into the crawl space by a previous long-forgotten tenant (back when SF used to make real stuff!). They were probably the last two surviving species from the ancestral swamp. Depending on the length of time you have been intimately familiar with SF, you may have heard of the terrible problem created when the SF sewage system built its EPA-required rainwater surge tunnel the entire length of the waterfront. As the dig progressed, many of the older brick buildings along the route cracked, even as the dig’s engineers swore it couldn’t be the fault of the project when it obviously was. One other tidbit of SF construction history (sometime in the late 70’s or 80’s): A two story residence had just been completed on the steep slopes of Mt. Davidson and was ready to be moved into when the house slowly toppled into the street one evening. It was a total loss. There was a known spring on the property, but the City had permitted the building anyway.